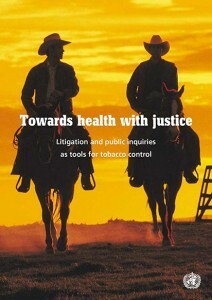 This website documents the history of litigation against tobacco companies since the 1950s. The site serves as a permanent companion to the traveling exhibit Towards Health Through Justice, which is sponsored by the Tobacco Policy & Control Program at the Medical University of South Carolina. Download exhibit slides here. Use the menus above to browse the contents of the site, which include details about important cases, timelines, narrative history, samples of tobacco media, and links to historical documents. Or read on to understand why this history is so important to American health. “Litigation as a tool for tobacco control has captured worldwide attention in the wake of recent legal cases in the United States of America and elsewhere. 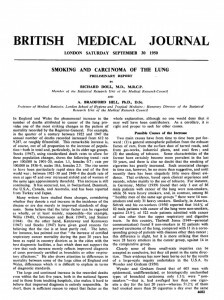 In the 1950s, research studies indicting smoking as a cause of human disease began to appear frequently in scientific journals. To counteract these accusations, the tobacco industry implemented a legal and public relations strategy intended to blunt the medical evidence implicating smoking as a cause of disease. The industry’s goal was to “create doubt” about the connections between smoking and lung cancer. On January 4, 1954, A Frank Statement to Cigarette Smokers was published coast to coast in more than 400 newspapers aimed at an estimated 43 million Americans. The industry statement falsely promised smokers that their health was of paramount concern and that the tobacco companies would cooperate with medical authorities to determine if smoking was really harmful to human health.